I was drawn to visiting the north of Vietnam for two reasons: 1) I’d dreamed about sailing between the karsts of Ha Long Bay for years and 2) ALL THE AMAZING FOOD (mainly I wanted the delicious Vietnamese food). 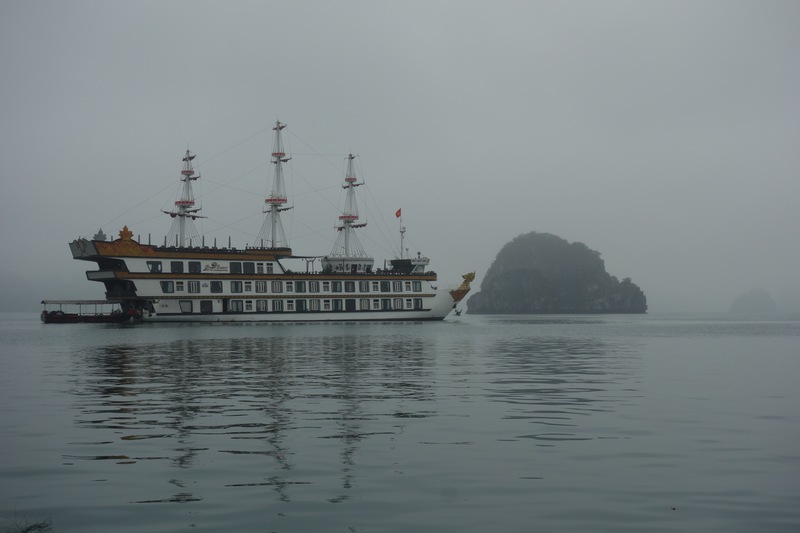 After much research, I ended up deciding to join a boat tour that would visit the less-crowded but equally beautiful Bai Tu Long Bay, which is right beside Ha Long Bay. 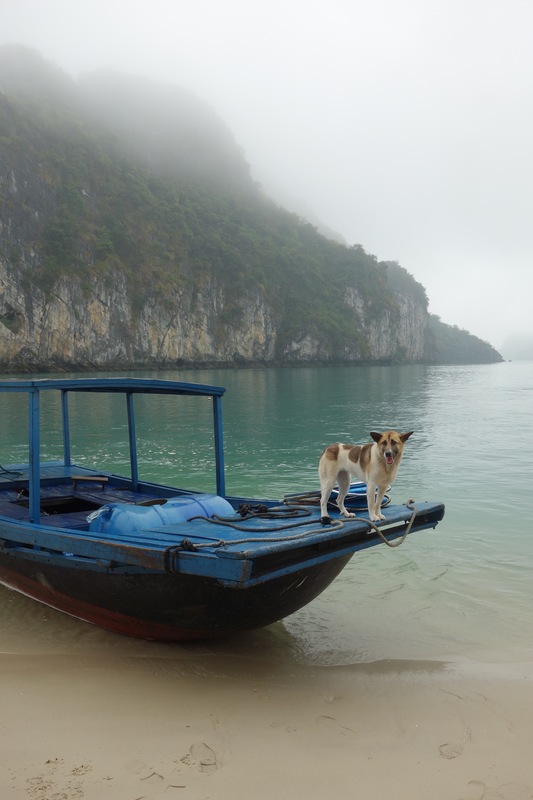 By taking a boat around this area instead, you are pretty much guaranteed unspoiled views of the landscape as there are nowhere near as many other boats around – I will always choose peace and quiet vs crowds, so Bai Tu Long Bay got my vote. 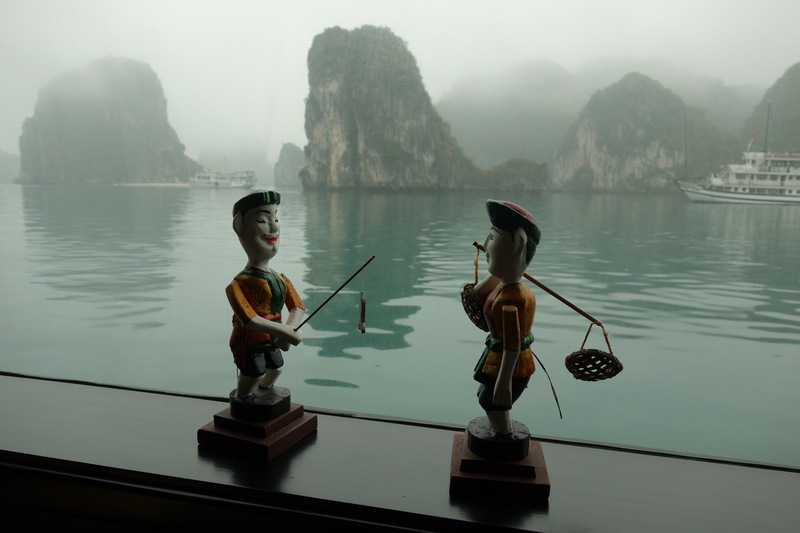 I joined the 2-day-1-night tour on IndoChina Junks’ Dragon Legend Cruise – this company has only a few very new and very well maintained boats with limited rooms, so it feels much more private. My trip started by flying into Hanoi and heading straight for the coast; the tour I booked included round-trip transfers from Hanoi to the cruise boat in a pretty swanky minivan. This drive took a few hours as the roads are not very well maintained and are only single lane in most places, so you inevitably end up getting stuck behind slow-moving trucks that are trying to navigate the potholes. Once on the boat, I sat down to a fantastic lunch as we began to make our way out into the bay. 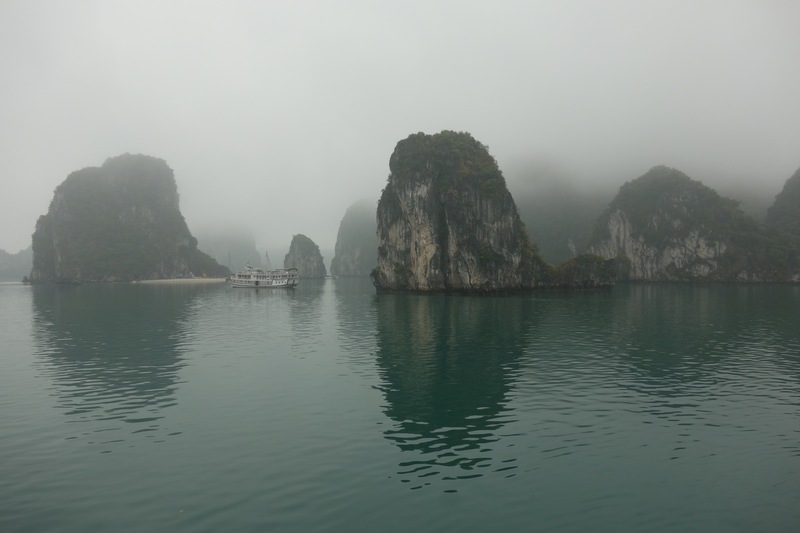 Unfortunately it was raining for almost the entire trip, but it did at to the mystery of the place as all of the rock formations and islands were shrouded in mist. Instead of taking a kayak out after lunch, I opted for the guided tour on a smaller covered boat to shelter from the rain. This was a great way to over a lot of ground (I’m not sure how far I’d have managed to paddle in a kayak) and see many of the interestingly shaped karsts. We even spotted a few eagles flying to and from their nests. 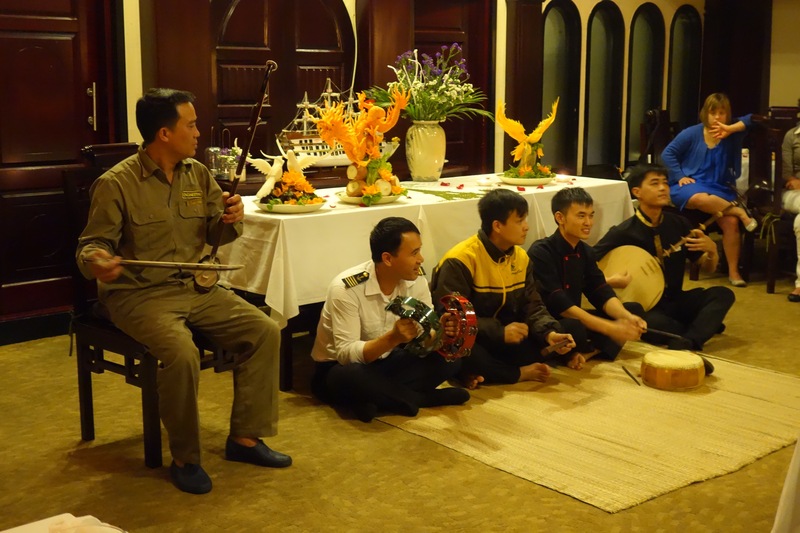 After dinner, some impressive vegetable carving demonstrations and traditional music performed by the boat staff, you are able to try your hand at some night-time squid fishing! I was entirely unsuccessful, but a few guests managed to catch something. 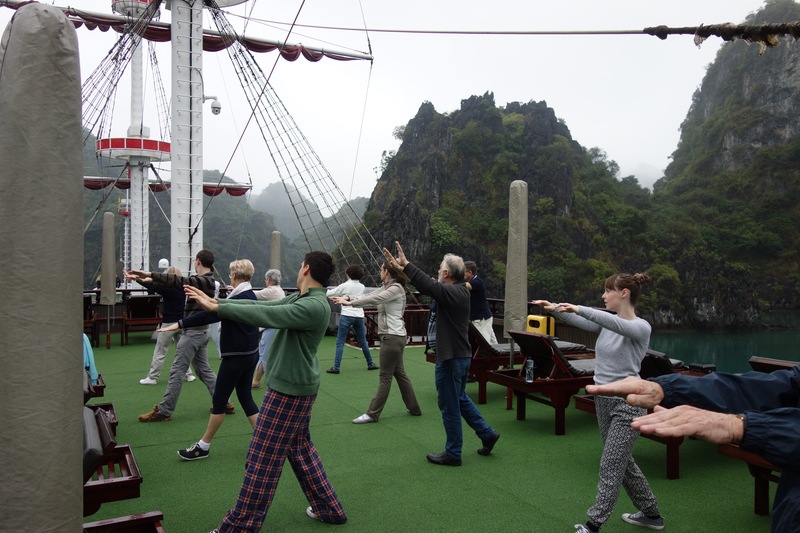 The following day I joined the morning Tai Chi class on the top deck – sailing through the mist, listening to classical music and performing Tai Chi was a very unique experience that was worth waking up early for. 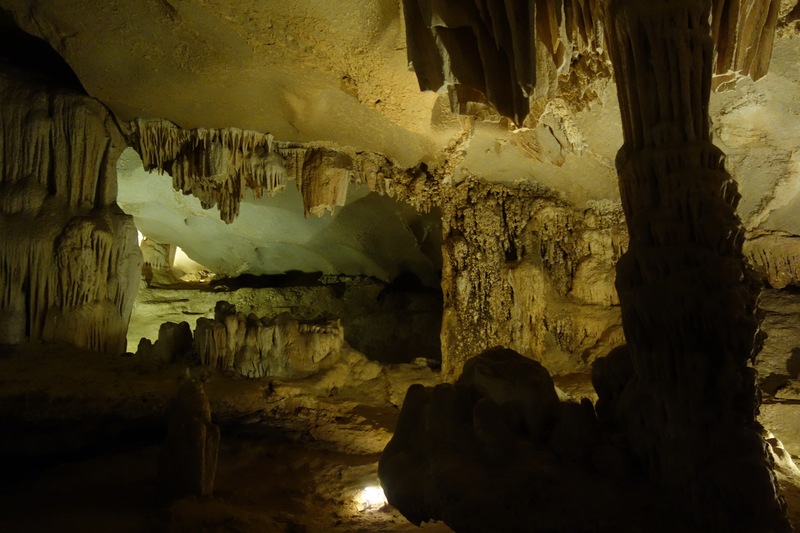 On our way back to dry land, the boat stopped off at a cave system for us to take a look inside. On the drive back to Hanoi, we made a quick stop at an “Agricultural Village” (i.e. fake village for tourists) where we watched a water puppet show (which was actually surprisingly good!) and were then encouraged to buy paintings/embroidery/sculptures made by locals. 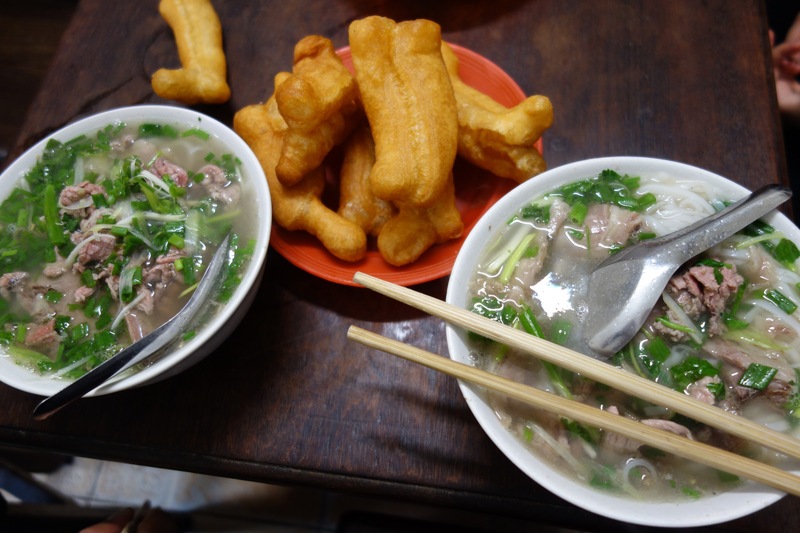 Once back in Hanoi, it was time for the food tour to start! I stayed at the Apricot Hotel, which was a charming colonial-style modern hotel that is right beside the lake and easy walking distance from everything in the Old Quarter. This hotel has a lovely pool and a bar on the roof with great views out over the lake and the city below. First thing’s first: breakfast. And in Vietnam, that means phở. Pho Gia Truyen (49 Bat Dan Street) is the best, but you’ve got to get there pretty early to beat the queue and also to make sure there’s enough left – they’re usually sold out by 11am. For lunch, try some of the food from any of the stands in the streets of the Old Quarter, there is plenty of bún chả (grilled pork with rice noodles), bún bò nam bộ (beef and noodle salad) and bánh mì (grilled and sliced meat sandwiches) to be found. For the best banh mi, head over to Banh Mi 25 (25 Hang Ca) – they are so good I ordered a second one before I had finished my first! All of these local snacks are best washed down with a cup of Vietnamese coffee – this extremely strong and bitter blend is usually mixed with condensed milk to take the edge off. For cheap beers and people watching, head over to the appropriately named “Beer Corner” (13 Hang Giay) for everyone’s favourite 20¢ Bia Hà Nội. 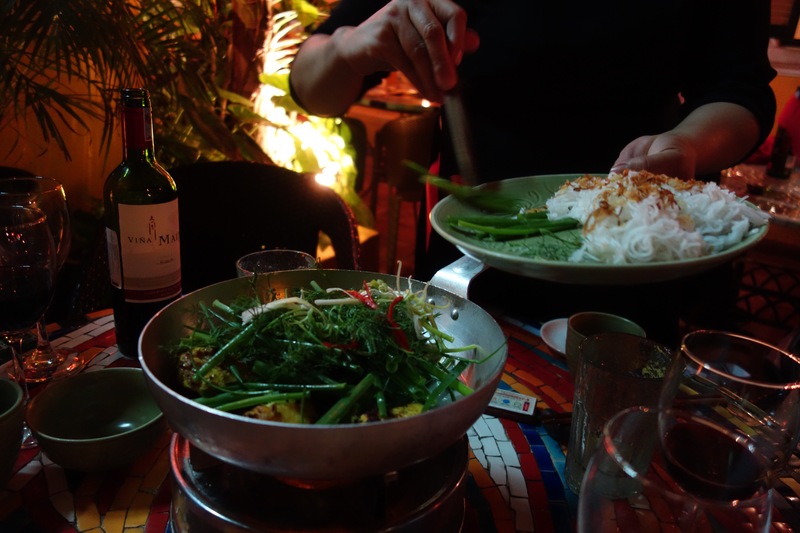 Dinner in Hanoi is an excuse to be transported back in time to the days of French colonialism. 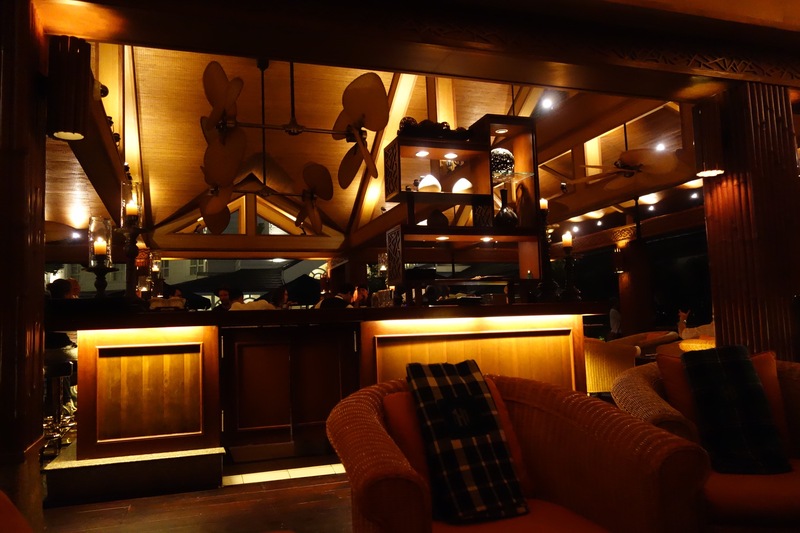 Start with a pre-dinner cocktail at Bamboo Bar – this gorgeous teak and rattan covered bar next to the pool at the Sofitel Metropole is Hanoi’s answer to Raffles. 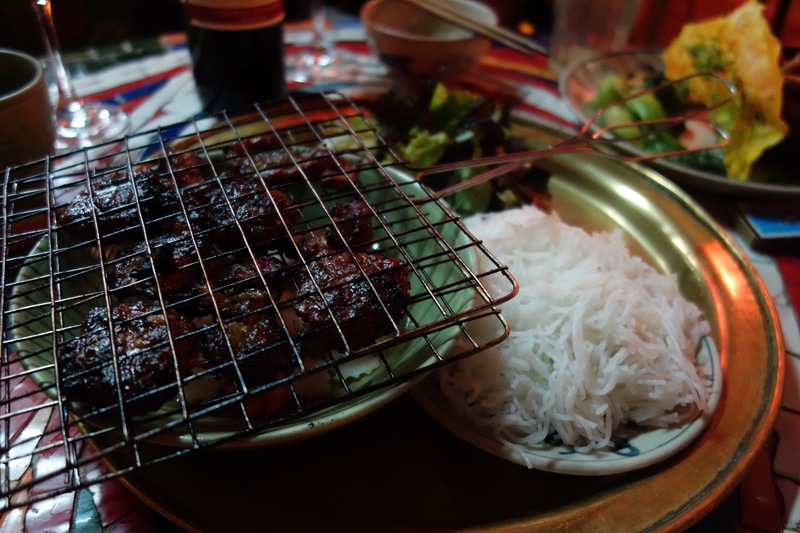 Then head on over to Madam Hien (15 Chan Cam, you need to make reservations) to relax at a table in the garden of an old French mansion and sample some of the best northern-Vietnamese dishes. Make sure to order the Chả Cá Thăng Long (fish cooked with turmeric and dill) which is Hanoi’s local speciality. If you have more than one night, then also book a table at Home (34 Chau Long). Also inside an old colonial mansion, this restaurant serves a slightly more modern take on the traditional local dishes. It’s a little further north outside of the Old Quarter, so better to take a taxi – it’s worth the extra effort for the food, the decor and the live string quartet who play all night. After dinner, head on over to Binh Minh Jazz Club (1 Trang Tien) to continue feeling like you’re living in the 1920s, stopping to admire the Opera House on your way there. You either need to get there before 9pm or be a bit aggressive to snag a table. 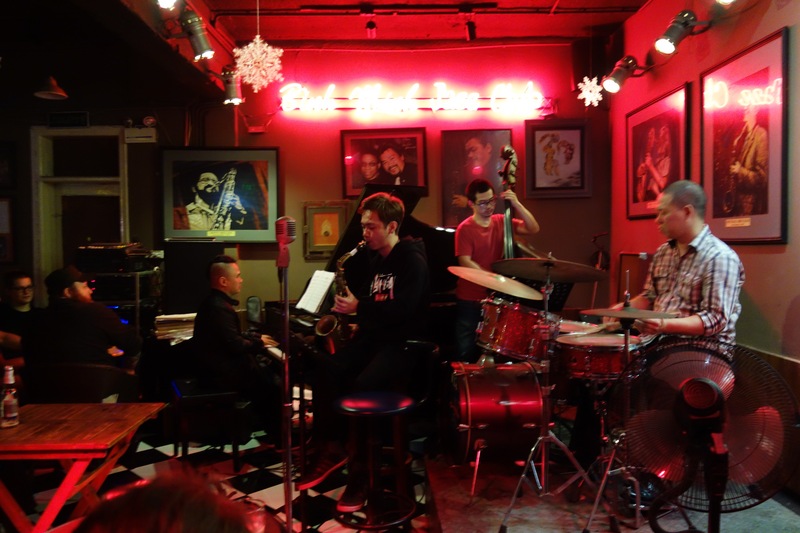 The drinks are probably the most expensive in Hanoi but it’s worth it to sit for an hour or so and listen to some incredible local and visiting musicians – this jazz club is very well known across Asia, so you often get some incredible artists travelling to play here. 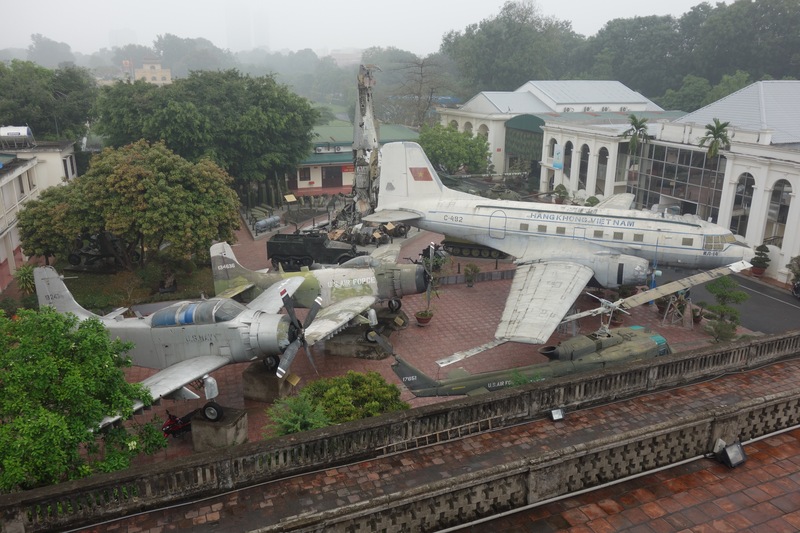 The Vietnam Military History Museum has large indoor and outdoor exhibits, featuring a number of aircraft. Ho Chi Minh’s Mausoleum and the surrounding parks and plazas are impressive to look at from the outside; come early if you want to see inside as there is always a huge queue of local tourists. If you’re lucky, you’ll see the changing of the guard (usually mid-morning, but not kept to a schedule). 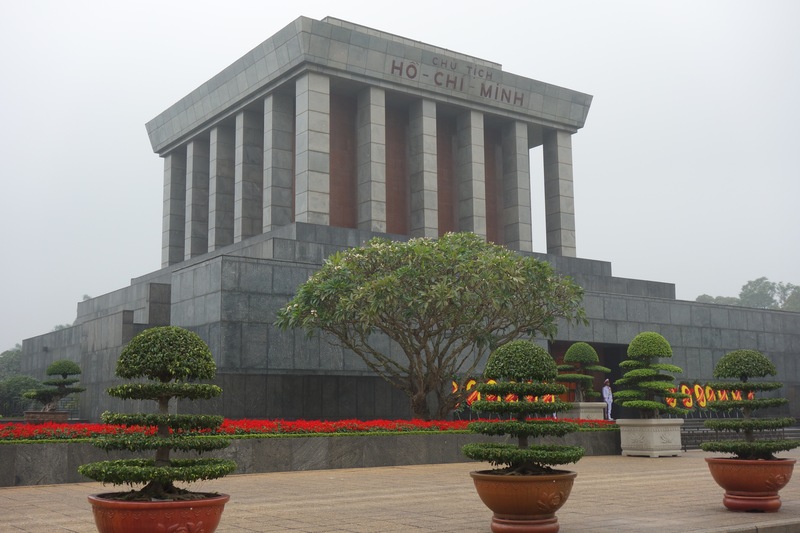 The Ho Chi Minh Museum is beside the mausoleum – check the visiting hours as they close for lunch. Hoa Lo Prison, or “The Hanoi Hilton” was originally used by the French Colonialists to house political prisoners, and more recently was used to house American prisoners of war during the Vietnam War – this is where John McCain was interned for a number of years. As with all museums in Vietnam, take everything with a large grain of salt – the versions of events are skewed to give a favourable view of their own country and are often heavily censored versions of the history we know about. 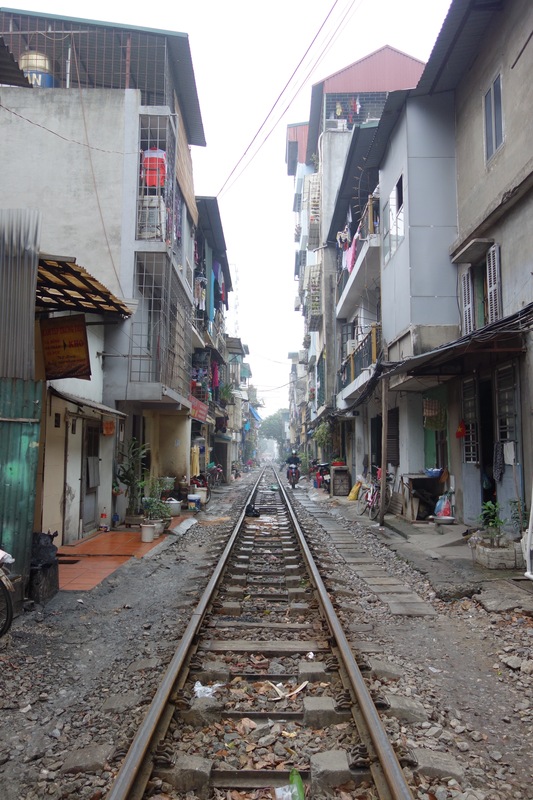 Another area worth checking out is the amazing “train street” – this narrow street of houses nestled between Le Duan and Kham Thien to the south of the main train station seems unbelievably tight for space when the train passes through twice a day. If you don’t have time to walk down to see it, there is also a spot between Tran Phu and Ly Nam De right next to the Old Quarter which has the same feel. How to get there: there are many international flights into Noi Bai International Airport (outside the north of Hanoi), or if you’re already in Vietnam you could take a train. Holly’s top tip: visit Bai Tu Long Bay instead of Ha Long Bay to avoid the crowds, and try all the delicious local food!